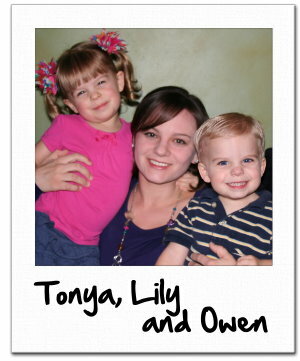 BrillKids Featured Parent: Tonya's Teaching Story - . :Early Learning Community:. Ever since we launched our website and initial learning programs in 2008, we have received a countless number of inspiring stories from parents who have chosen to go on the wonderful journey of teaching their children. Some of them are just too good to keep for ourselves, so we've decided to share and feature some of these fantastic teaching stories with you! We hope that these short features will help inspire you to become your child's first and best teacher with BrillKids! I am the proud mother of three-year-old Lily (November 2008) and two-year-old Owen (December 2009). I currently reside in Virginia Beach, Virginia with my husband and children, but I grew up in Chicago, Illinois. My educational background is in Recreation and Tourism and I spent most of my career working with military families at a recreation facility in southern Spain. Since the birth of my children and returning to the U.S., I took a break from full-time work to enjoy raising and teaching them. How did you get involved in early learning? A friend told me about a very bright little girl she knew whose parents taught her to communicate through ASL as an infant. I was intrigued and began showing my daughter Baby Signing Time videos at 4 months old. Lily made her first sign back at 10 months old and mastered the entire series by 13 months old. I was amazed that she was able to learn so easily; she soaked up information like a sponge! I instinctively knew that I needed to keep teaching her because she clearly loved learning and her progress was startling. I had heard of teaching babies to read, but like many others, I felt intimidated because I didn't know where to begin, what to teach her, or how! 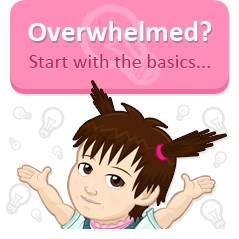 I settled on a DVD-based infant literacy program and Lily breezed through it within 4 months. Although she had memorized all of the words shown in the DVDs, she was unable to decode new words or read short sentences. It was then I realized that DVD learning systems have their limitations and I began looking for more teaching materials. I read Doman's book on infant literacy and briefly attempted his method, but making hundreds of flashcards by hand was simply unrealistic as a busy mother of two. When I finally stumbled on Little Reader, I knew I had struck gold--this was the program I was looking for! Little Reader gave me so much confidence to teach my children because the daily lessons were incredibly straight forward. The work was already done for me with no late night flashcard making marathons required! After introducing Little Reader, Lily picked up hundreds of new sight words in the first two months. By 19 months old, she was able to phonetically sound out words she had never seen before. We continued to use Little Reader daily and her vocabulary grew by leaps and bounds. I went on to use the system with my son Owen and he followed in Lily's footsteps with the same phenomenal results. Hands down, Little Reader is the best early learning system out there - a must have item for every new parent! How has early learning impacted your family? Choosing to be my children's first teacher has definitely increased the amount of quality time I spend with them. We typically use BrillKids software first thing in the morning and then have story time with our BrillKids Storybooks, Fables, and flap card binders throughout the day. We frequently play learning games such as counting toys and snacks, molding play dough, and solving puzzles. Above all, our primary aim is to have fun while we learn. It's amazing to observe the look of pride on my children's faces when they truly understand a concept for the first time or read a new word in a new language. You can almost see the light bulb flash above their little heads! As parents, we're always looking to find teachable moments within our daily activities and interactions. We've tried to adopt an early learning philosophy that guides all of our parenting decisions. Early learning has shown us what our children are really capable of, as well as how much fun we can have teaching them while growing closer as a family. You've been on this journey a little over two years, how are your children progressing overall? We started out focusing on teaching the kids to read, but have since expanded to other subjects. Lily just turned three years old last month and reads at approximately a first or second grade level, reading fluently for knowledge and entertainment. She draws many connections between the world around her and information she acquires from books. Her favorite books are classic fairy tales and beginning science books about animals and insects. Lily reads simple books in Spanish and is building up her decoding skills in Russian. She is solidifying her addition and subtraction skills on paper and she understands the concept of fractions. Handwriting is one of her favorite activities and she recently began spelling out words phonetically. She can correctly identify notes on a staff and sings along while plunking out nursery rhymes on the keyboard daily, thanks to Little Musician! Owen turned two this month and is reading at approximately a kindergarten level. He can decode most individual words he encounters, including some multi-syllable words. He is currently building up the stamina to read longer sentences and short books. His expressive language skills are still developing, but he is able to read more words in a sentence aloud than he spontaneously speaks throughout the day. He currently reads in English, Spanish, and has begun early exposure to Russian and Chinese. His favorite books are the Little Reader Storybooks and Aesops' Fables, particularly The Crow and the Jug. He enjoys watching Little Math using customized family photo icons and he has learned to recognize quantity. Like Lily, Owen also adores Little Musician and they take turns selecting their favorite songs. He is just drawn to music now and randomly sings scales for fun while playing with his toys! Why do you think early learning is so important? Early learning is important because a child's first educational experiences can set the tone for the rest of their academic career. Early learning puts children on the right track from the very start and lessens the likelihood that they may later "fall through the cracks." My youngest brother was one of the children that fell through the cracks. It wasn't until the end of the seventh grade that my parents discovered he was reading about three to four years below grade level. My brother was so ashamed of being a poor reader that he hid it for years, until he could hide it no more. He had been far too embarrassed to ask for the help he so desperately needed. By this point, his teachers recommended that he repeat the 7th grade on account of his reading deficiencies. My father tasked me with tutoring him over summer break, a private tutor was not an option for our family due to financial limitations. I was 15 years old and it turned out to be absolute misery for everyone involved, with tears and frustration every step of the way. We must have read through the same copies of "Highlights for Children" magazine dozens and dozens of times. Miraculously, after a summer of intense tutoring my brother's reading skills dramatically improved to an 8th grade level. The school was convinced he cheated on his test and forced him to retake it. He then tested at a 9thgrade level and was permitted to enter 8th grade with the rest of his class. While this story has a happy ending in the short term, unfortunately that is not the case over the long term. The intervention was simply too little, too late, the damage was done. All of the years he spent as a weak reader compounded and left him with major knowledge gaps in nearly all subject areas. The repetitive negative school experiences had a detrimental effect on his attitude towards learning, his study habits, and his overall perspective on life. His situation so clearly demonstrates why early learning is vital; it removes barriers and has the power to transform the lives of young children! My brother's horrific school experience, the constant reading struggles, and the feelings of academic inadequacy simply never had to be. I believe in my heart that his life would be very different today if he had been taught to read as an infant or toddler. He granted me permission to share his story in hopes that it would encourage parents to make literacy a top priority from the very beginning. Do you have any advice for those parents just starting out on this journey? Start where you are and just do it, you will learn as you go! If you don't know where to begin, I recommend downloading the e-books available on the BrillKids homepage and taking the Little Reader free two week trial. Also, take the time to introduce yourself on the forum, read through old posts along the way, and ask for help when you need it. Teaching your children is so very worthwhile and the seeds you plant today will undoubtedly blossom in time. How has BrillKids helped you and your family on this early learning journey? BrillKids has helped us in so many ways! Primarily, it has helped us teach our children easily and effectively while bonding together as a family. We love the Little Reader daily curriculum, but over time we have grown to love making personalized files, too. I was thrilled when I found out that Little Reader gives parents the option to create customized content, something that just wasn't possible with other DVD learning programs we used. Uploading pictures of our extended family members that live out of state helps the kids better remember them between visits. They warm up to Grandma so much faster now! Little Reader also helps us document our travels and activities. We've created customized stories showcasing our trips to the aquarium, the park, summer festivals, and other special outings. My kids love to see their faces on the screen and they really connect with the stories that were written just for them. It's a wonderful way for us to reinforce reading skills while reliving those precious memories time and again. Our customized stories have become a digital scrapbook of sorts that our children continually delight in. Without question, BrillKids early learning systems have been the most helpful and effective compared to other early learning programs we've tried. The BrillKids forum has also been an invaluable resource; I've learned so much from being an active member of the forum! Learning from other parents' experiences has helped make me a better teacher to my own children. I can post messages day or night to connect with like-minded parents around the world and the encouragement and sense of community the forum provides is irreplaceable. I frequently use the "search" feature to find information on just about any subject imaginable related to early learning. The forum is truly a treasure trove of knowledge! BrilKids has helped our family so much and I am inexpressibly thankful for it every day. In BrillKids, I found the confidence to teach my own children, the software to make it easy and fun, a community that gave me a place to belong, and now an opportunity to help other children reach their full potential both on the forum and beyond. Teaching my children to read was a crucial experience that helped me uncover a passion for early education that I previously didn't know existed. In 2011, I became a BrillKids Forum Moderator and joined the BrillKids Foundation team. The BrillKids Foundation promotes "early education for every child" and grants software to schools, social services, underprivileged children, and children with special needs around the world. I am so grateful to be part of a team that helps impact the lives of disadvantaged young children through early learning, taking kids from at-risk to one-step-ahead. The Foundation aims to brighten the futures of over one million children through early literacy. Visit www.brillkids.org to learn more about how the BrillKids Foundation can help individuals and charitable organizations in need. Inspired by Tonya's story? You can inspire others, too! Get the opportunity to inspire others with what you and youir children have accomplished with BrillKids! If you think that you (or someone you know) deserve to be featured as a BrillKids Teaching Parent, let us know! Write us and let us know why we should feature you as a BrillKids Teaching Parent! Thank you for this. TeachingMyToddlers, your story is truly inspiring. I'm very happy to have met people like you in this forum - I am reminded of my own teaching story and I can only hope to be able to do for my own kids what you have done for yours. Really you have done great. Tonya and her kids are super. I am rally inspired by this forum and now going to introduce this LR ,LM to my creche and playschool. I haven't visited the forum for a while now, but I'm glad to find such an inspiring story just when I decided to check back in! Thank you very much for sharing your family's story with everyone, Tonya -- I look forward to more fantastic stories from all super moms and dads out there! Actually, I have started this journey with my 6 months old daughter, for two months. I'm teaching her English while it is not my native language. I'd like to teach her our own native language as well as another language. But I don't know how and when to start another language so that she won't be confused. Could you let me know about your experience and suggestions regarding that? You can present flashcards to your child in your non-native language. The "rule" is that as long as the sessions are a few minutes apart (10-15 minutes) they won't get confused. I have violated that rule on occasion without any issue. The kids just *know* somehow the differences in the sound and look of different languages, and your baby will too! Once you are comfortable teaching the first language, then you can add a second subject such as a 2nd language. It's best to add in one component at a time to make sure you can stick with it. If you're not sure how to speak the language yourself, it's best to download files in the LR library in your language of choice. Play them with your baby and repeat along with them so you can learn too. You can also supplement with random DVD's in that language of choice. I choose to also supplement about once a week with babysitters that speak the languages that I want them to learn. They get fairly regular practice with me and Little Reader, and then reinforcement once every week or every other week with a native speaker. However, we also dabble in Chinese from time to time and we do NOT have a local native speaker for reinforcement, and that's okay! We are still learning with the LR Chinese Curriculum and they can recognize some characters, etc. -Take a break for a week or so, so that it becomes fresh and new again. And during that break, make some custom files to draw her back in. -Create a new routine. Is your DD in a high chair? If so, just put her in her high chair for breakfast and show LR. Even if she doesn't look fully in the beginning (remember 360 degree learning), keep playing it, even if you just start with part of a lesson. After several days of this, she should grow to expect it. (assuming she's not *crying* about it or anything like that, we're not forcing, we're enticing, setting it up so she WANTS to do it. -Make a couple of some custom files she will LOVE, even just one or two. Take pictures of mommy, daddy, grandma, the dog, her room, her bed, etc. I might even make a story that reads something like this. This is my morning routine. When I wake up, Mommy hugs me. It's my special time with Mommy. Little Reader helps me read. This is my bedtime routine. Mommy dries me with a towel. She should be drawn to the files because her picture is in them. How you present it is really important, get excited when doing flashcards in general, overemphasize your enthusiasm if you have to in the beginning. Talk to her and point out things on the computer. At night, turn off the lights in the room (or turn them very low) winding down for the evening and sit quietly cuddling with a sippy of milk/nursing/bottle. Protect the routine on a daily basis and she should come to expect and enjoy it immensely. If she's not a splasher, you could set it on the bathroom sink and show it while she's in the tub even. (I don't know how old she is, and that is if you have a wide counter that is sturdy to set it on with no chance of it falling in. Just be careful doing this, and I would not plug in the laptop in but only use it on the battery, just in case). Or find a relatively healthy snack she loves to give her daily while you watch Little Reader, always at the same time. Before nap, after nap, etc. Something she really adores and only gets at that time, some kids like cheerios, or dried fruit, or a single semi-healthy home-made cookie. You are her Mom and you know what her currency is! You might even take a break from the other videos for a while until you get her set in this routine, then incorporate them back in. Also, you can PRINT OUT all of the cards. My kids used to like when I did that, and put them in the BrillKids flap books or plastic page protector sleeves. Sit down and read through them like story books, or flash them very quickly right-brain/doman style. Also, download the "musical instruments" file by cyndec, it's great! Consider showing some the stories that are available in semester 2 with cartoon style animation. What if I said that I will give you a million dollars if you figured out how to make your daughter fall in love with Little Reader by her own choosing with no forcing? I bet you could figure it out.